KR Strikeforce created the Hybrid X Triple Roller as a value priced option for anyone looking for all the high priced features of an expensive 3 ball roller at a reasonable price. They know we are not all made of money! 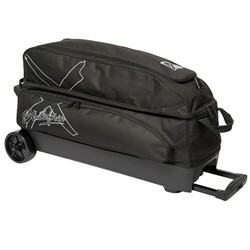 Handle: Retractable square locking handle extends to 45"
Extra large separate shoe compartment. Does the shoe compartment come off? Hello! No, the shoe compartment does not come off of this bag. Hello Russ. This bag will weigh about 12-15 pounds. Yes, this bag can stand up on its own. This roller will have two 5" wheels. Free Ground shipping is 3-7 business days. It will have retaining straps to secure the bowling balls. What kind of straps and connections hold the balls in place? 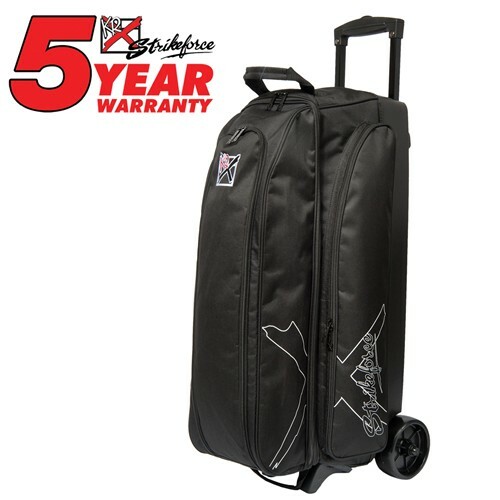 Due to the time it takes to produce the KR Strikeforce Hybrid X Triple Roller ball it will ship in immediately. We cannot ship this ball outside the United States.